Greek metal legends Rotting Christ return to Malta on Saturday September 23rd, for an exclusive show at The Garage in Zebbug. This will be the first time the band have been allowed to perform in Malta under their actual name (in part due to the abolition of the country’s Blasphemy Law in January of this year). 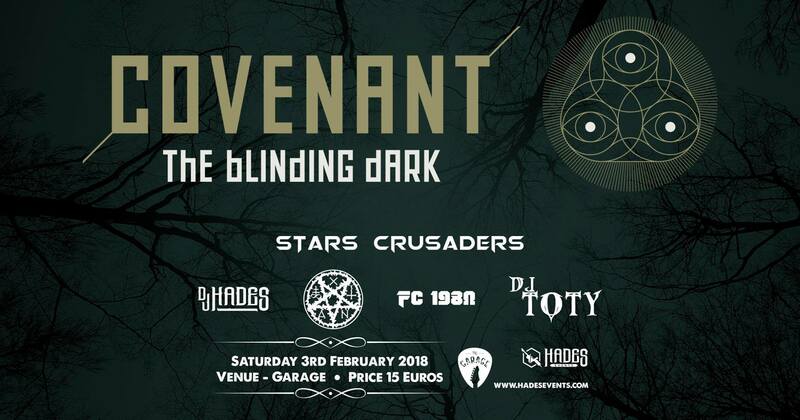 Fans can expect a wide range of classic Rotting Christ material, coupled with some of their latest offerings from 2016’s ‘Rituals’ album, as well as support from 2 of Malta’s finest homegrown talents – veterans X-Vandals and the talented Decline The Fall. As time passed the band had a falling out with Osmose Productions resulting in each complaining of the other. The collaboration dissolved at this point under a particularly heavy climate with ROTTING CHRIST blaming the company for not satisfying the band’s needs while Osmose claimed that the group lacked professionalism. The war of words continued as the years passed however Osmose decided to never re-release anything that had to do with ROTTING CHRIST. In the following months the band decided to sign on with Unisound which made the best offer yet. “Non Serviam” was released at the end of 1994. This is an album which is definitely worth its weight in gold with classic compositions like “Non Serviam” (that eventually became a concert must and which the band continues to close their live shows with), “Saturn Unlock Avey’s Son” “The Fifth Illusion”, “Wolfera The Chacal (Neoplasia)” etc. The album has a characteristic sound of the Storm studio (which was essentially the band’s private studio) that marked the whole Greek scene. The minimal promotion abroad cost their fans the chance to hear this album. Actually, many people believed that ROTTING CHRIST had broken up after “Thy Mighty Contract” since they never heard or saw “Non Serviam”. For the record, the album was released on CD, LP, picture LP and cassette. Sakis’ Necromayhem initiative led the band to Mexico in April of 1995 performing 2 live shows in front of over 2000 people. The bootleg video that exists indicates the incredible devotion and dedication of their fans. Rumors of the band appearing live in Greece were never realized. In Greek Metal Hammer’s “Best 100 Heavy Metal Albums” exclusive where readers were asked to vote for their favorites, “Non Serviam” came in 59th! “Thy Mighty Contract” was also placed in the top 200 in the same issue. After “Non Serviam” MWD left the band because he felt that ROTTING CHRIST’s style didn’t represent him anymore. Bewildered with their relationship with Unisound, ROTTING CHRIST recorded some new tracks and personally delivered the cassette to the German offices of Century Media and Nuclear Blast labels. Soon after they Century Media offered a 6-album deal. The band also had offers from other independent metal labels such as Avantgarde, Necropolis, Misanthropy etc. ROTTING CHRIST finally chooses Century Media and signs. December of 1995, the Greek Metal Hammer circulates its first compilation CD “Hammer Holocaust”. The first track is a “Snowing Still” demo version in which Shadow from Wampyre Shadow Wolf provides the vocals (he is none other than George Florakis, editor of Metal Hammer). Their inclusion on this compilation gave them even more publicity in the Greek scene and gives a taste of how the new material sounds. Something similar had occurred with the release of “Non Serviam” when Metal hammer had included a cassette sampler from Unisound bands, “Into The Catachthonium” (where one can hear “Saturn Unlock Avey’s Son” track). In April of 1996, their new album “Triarchy Of The Lost Lovers” is released. Recorded for the first time abroad and with drums played by Themis Sauron, unlike with “Thy Mighty Contract”, and “Non Serviam” albums where a drum machine was used. Andy Classen of Holy Moses produced the album. ROTTING CHRIST somewhat distanced themselves from the black metal sound that the 2 prior albums possessed and turned to more classic heavy metal-oriented style without losing the aggression. Again the album contains classic compositions like the opening track “King Of A Stellar War” and “Dynasty From The Ice”, “Archon”, “Shadows Follow”. During the recordings Sakis and Themis were infected with a childhood disease, the measles and this somewhat complicated their work. Their fame grew even more with their 2 month European tour together with brotherhood bands and labelmates, SAMAEL and MOONSPELL. They played in 14 countries (Italy, Spain, France, Switzerland, Austria, Germany in the Out Of The Dark Festival with THEATRE OF TRAGEDY and GOREFEST, Belgium, Holland in a festival with AMORPHIS and THERION, Czech Republic, Poland in a festival with IMMOLATION and CANNIBAL CORPSE, Denmark, Finland and Norway in the “Hell On Earth” festival. The tour was a great success. Unfortunately, the only member on tour from the band was Sakis. The rest of the members were session musicians since Jim Mutilator and Themis were unable to fulfill their obligations due to personal problems. On the second guitar was Kostas (ex Corruption member) and who eventually became a permanent member of ROTTING CHRIST. The album does very well in Greece and abroad and a bit later, a limited edition digipack with 3 bonus tracks is released. The bonus tracks are well-known covers of KREATOR’s “Tormentor” and the medley “Pleasure To Kill / Flag Of Hate” in which Mille Petrozza was supposed to participate as a guest vocalist as was originally planned. Mille found the covers extremely interesting and right he was, since they truly are! Meanwhile, Century Media released the picture 10” “The Mystical Meeting” which was a 500 copies limited edition and includes these covers. Jim leaves the band due to personal reasons as his family and professional obligations were overwhelming (he had already opened the well-known Metal Era record shop in the center of Athens) and he could not follow the band’s heavy schedule. Century Media is purely a demanding and professional company and expected the band to be 100% dedicated, something that was impossible for him to do. His departure was under friendly conditions and naturally had nothing to do with the idiotic rumors that were spread such as his inability to play bass. Sakis continued writing new songs and finding new members to join ROTTING CHRIST. We’ve come to the summer of 1997 and ROTTING CHRIST are preparing to take part in the Rockwave festival at the Apollon Stadium in Rizoupoli, Athens along with MEGADETH, BRUCE DICKINSON, GRIP INC. and DARK NOVAN. 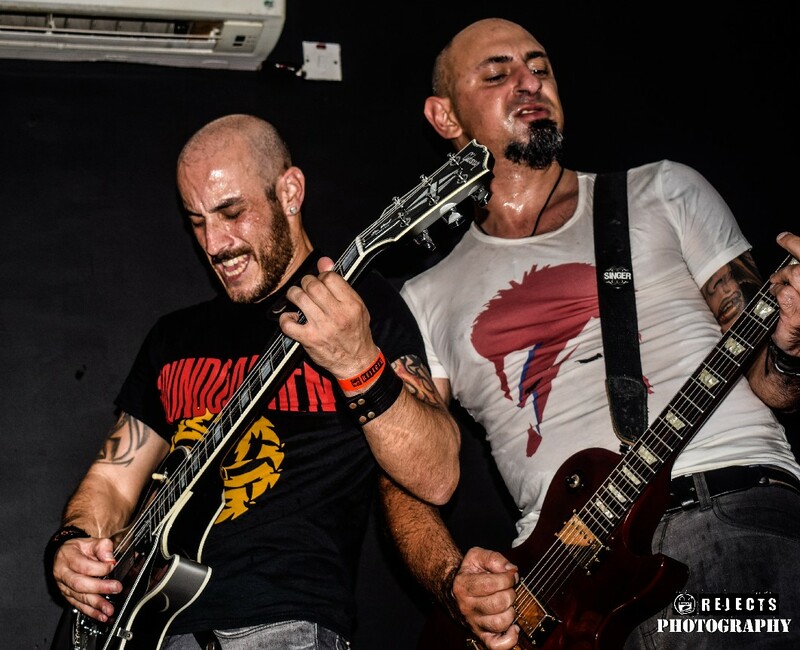 Three years after their appearance at Next with SAMAEL they play once again in front of their Greek fans, receiving an enthusiastic response to their 6 songs. Half the songs were from the forthcoming “A Dead Poem” album (it came out August 1997). Despite the fact that the audience was not familiar with the new songs, they were very well received. The only complaint was the band sound conditions, which was not exclusively the band’s fault. “A Dead Poem” provokes quite a bit of emotion due to the new sound that the band had developed. They distanced themselves even further from their black metal past and incorporated catchy heavy riffs, mid-tempo rhythms and atmospheric parts. On keys was XY from SAMAEL and the album was recorded at Woodhouse Studios, produced also by XY himself. The album includes 2 tracks that become in a certain sense “hits” both in Greece and abroad. These are none other that “A Sorrowful Farewell” and “Among Two Storms”. On the second track, Fernando Ribeiro from MOONSPELL participates in the refrain. Up till now, “A Dead Poem” remains ROTTING CHRIST’s most commercial album (in respect to the numbers sold and the quality of the sound). In Greece alone it has sold over 6000 copies! At this point the band also becomes known in a circle that is unrelated to black and death metal. In addition the old logo is no longer used and is replaced by a gothic font and this provokes a chaotic response from some old die-hard fans who believe that the band has forgotten its roots and its black metal past. Also the pseudonyms are history since the band decided not to use them anymore because they didn’t fit with the new direction. In September 1997 the band appears at the Open Air Festival at OAKA which was organized by Metal Invader magazine. This was a historic day for ROTTING CHRIST as they played with VENOM, the band that urged them to pursue music in the first place. In addition, EMPEROR, THEATRE OF TRAGEDY, VIRGIN STEELE and DEVISER took part. Here they played a good set and dedicated “Shadows Follow” to Jim Mutilator. The 3 Turkish dates were of great importance for the band since over 1000 persons attended each show, almost glorifying ROTTING CHRIST. Next came another European tour with TIAMAT for 20 more days. 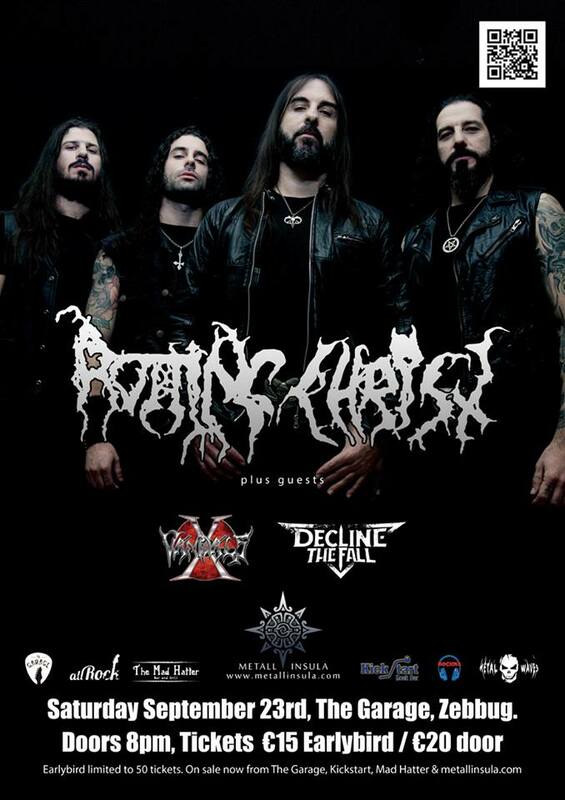 In October, ROTTING CHRIST gives a historical show to Athens famous Rodon Club, being the first Greek metal band to appear live as a headliner in the specific venue. Support bands were the Greeks ORDER OF THE EBON HAND and EXHUMATION. The next step of the band was to compose a new album. It was finally released in January 1998, entitled “Sleep Of The Angels”. 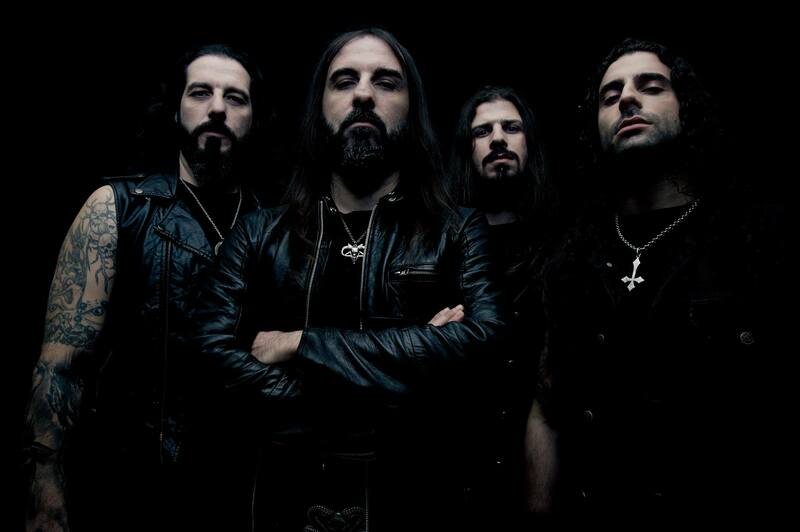 Keyboardist Panayotis leaves ROTTING CHRIST and new member George replaced him. “Sleep Of The Angels” is a step forward for the band that has added many gothic elements but it still remains a metal album from the first to the last second. Two weeks prior the release of the full-length album, the “Der Perfecte Traum” 7-track single was released. It includes the self-titled track taken from the forthcoming “Sleep Of The Angels” album, “Moonlight”, an unreleased track that is not available in any other album and 5 live tracks (marked by the bad sound though) recorded in Poland during 1996’s European tour with SAMAEL and MOONSPELL. This release is very well received by the fans especially in Germany. It is the first ROTTING CHRIST song to have lyrics in other language than English (except some older tracks which had latin lyrics), moreover the initial thought was the German parts to be sung by Till Lindemann, RAMMSTEIN vocalist! The fans’ reactions are once again overwhelming and ROTTING CHRIST’s audience is broadened. Some older fans still complain about the fact that the band keeps composing music much different from its early material, but one can hear some elements of their black metal past in tracks like “The World Made End” or “Delusions”. “Sleep Of The Angels” remains a stunning album which leads the band to its first world tour ever. First comes a massive European tour with DEICIDE, ANCIENT RITES, AETERNUS and BEHEMOTH. Then ROTTING CHRIST travels to the USA for a multi-city tour. The band toured in a small personal van while Themis and Kostas drove without even having a driver’s license! The band moves on to conquer other countries of Latin America like Colombia and Brazil, where their die-hard fans show their extreme dedication in every single show they make. In Mexico, a 6,8 R earthquake leads to Themis getting injured but fortunately not seriously and leaves the whole band shocked. Afterwards, ROTTING CHRIST returns to Greece to end the tour with a very successful show at Rodon Club (characterized by a crystal clear sound) and a small tour in the Greek country. In this specific Rodon club show, old friend of the band from the early 90’s Gunther Theys (bassist/vocalist of ANCIENT RITES) participates in the refrain of “The Sign Of Evil Existence”. Actually the same live concert was attended by the well-known Greek dark artist Vasilis Arnaoutoglou, who, impressed by the sound and feeling of the band, proposed Sakis to make a video-clip for one of their tracks. The result of their collaboration was the first ever -and only so far- “After Dark I feel” video clip. It is a very unique video, which doesn’t show the band typically playing on stage, but it reflects paradox and dark images for the visual representation of the track. The summer of 2000 marks the release of the new “Khronos” album. Already before its circulation, the band lets it be known that the forthcoming opus is a very deep album with intense black metal feeling and partly returns to the old feeling. Old member Magus Wampyr Daoloth was supposed to participate in vocals in some track but it finally never happened due to various technical problems with the latter’s heavy business program. Indeed, “Khronos” includes pure black metal tracks like “Thou Art Blind”, “Aeternatus”, “Glory Of Sadness” and in general, the album transcends a black feeling that was more or less absent in “Sleep Of The Angels” and “A dead” albums. Recordings took place in the Abyss Studio with Sakis producing the album, in collaboration with Peter Tagtgren from HYPOCRISY. For the record, the initial album title was “Chronos 666”. This full-length includes for the first time in the band’s history a cover tune which is no other the than classic CURRENT ‘93 (a dark wave band) track “Lucifer Over London”. ROTTING CHRIST transformed “Lucifer Over London” into a very dark and heavy metal tune, marked by the band’s personal touch. Actually, CURRENT ’93 singer David Tibet phoned Sakis to personally express his gratitude and admiration for their effort. “Khronos” cover artwork (created by Spyros “Seth” from Septic Flesh) is basically a visual image of the band’s name, depicting the crucified Jesus Christ in high-level decomposition. A headline European tour follows together with support acts VINTERSORG, MADDER MORTEM and TRISTANIA, as well as many concerts in various other countries. The tour ends once again with a sold out live concert at Rodon and a mini-tour in the rest of the country.